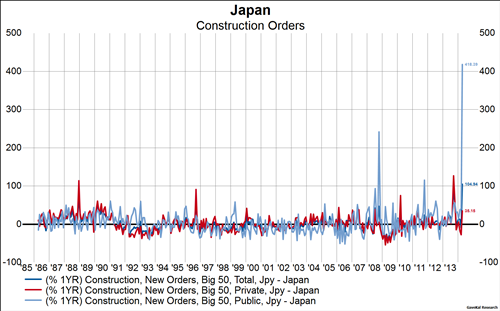 It is a widely accepted view that Japan’s economy will contract in Q2 and today’s data almost ensures that. This is due to the sequential fall in consumer spending as a result of demand being brought forward into Q1 to avoid higher consumption taxes. Indeed, data released today show that personal income and consumption expenditure in April fell by the most since the natural disaster in 2011 (1st chart). 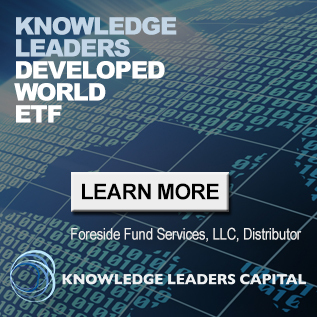 The government, in a valiant effort to offset the decline in household consumption, has decided to bring forward 40% of the planned 2014 fiscal stimulus (about 1.1% of GDP in total) into Q2, which will boost GDP by about 44bps (1.76% annualized). Even still, this amount of fiscal stimulus will not be enough to avoid Q2 GDP from contracting as GDP is expected to fall by 2.5%. What it does instead is actually raise the probability that Q3 GDP also contracts due to the likely sequential slowing in government spending. 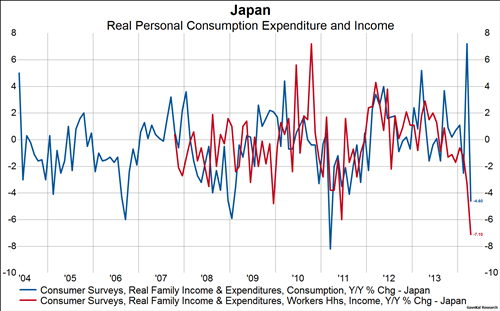 If the Japanese government took a kitchen sink approach (and they likely would have been given a free pass because of the tax hike) they could have allowed Q2 GDP to fall sharply by postponing any fiscal stimulus until Q3, thereby increasing the odds of a strong sequential rebound in Q3. But this is not the tack they chose and so getting a technical recession (two sequential quarters of GDP decline) is a higher probability event. 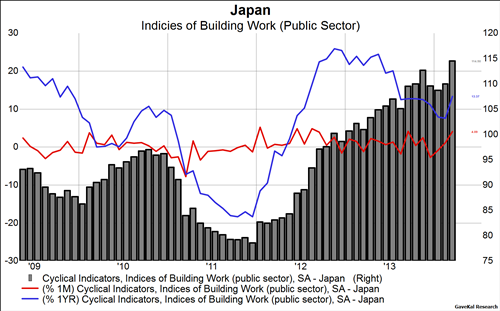 In the second and third charts below we can see the Japanese fiscal stimulus at work as planned public construction spending in April rose by the largest YoY percent on record.